It's Christmas Eve, and Ed has gathered his three adult sons to celebrate with matching pajamas, trash-talking, and Chinese takeout. But when a question they can't answer interrupts their holiday cheer, they are forced to confront their own identities. 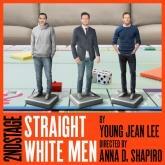 Straight White Men takes a hilariously ruthless look at the classic American father-son drama. This is one white Christmas like you've never seen before.